Sick of sandwiches? Bored of bread? 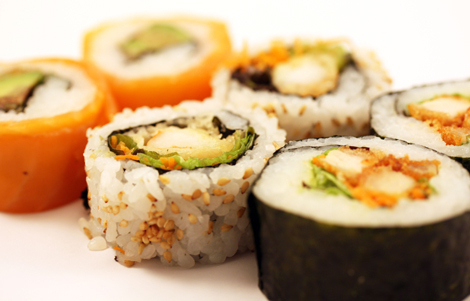 Japan Centre promises to fulfill your lunchtime cravings with our wide range of sushi and bento! All Japan Centre sushi and bento are freshly prepared on the premises daily by our expert team of chefs. White or brown rice, organic, mixed rolls, fried fillings, raw fish, inside out rolls, Californian, vegetarian, onigiri, nigiri… there’s sushi for every taste! Alongside sushi, try hot bento such as teriyaki, shogayaki and gyudon served with fresh hot rice & pickles. Also available are handmade gyoza, noodles, katsu, curry and more all prepared by our fantastic Restaurant Toku chefs each morning! If you like the look of our selection in the photo above, pop into our store for our full range, we do not currently deliver. Voted #1 Delicatessen in London by user-generated local review site Qype, see what everyone is talking about! Prices start from a credit crunch busting £1! Hot Ramen cooked in front of you now available! Posted in Uncategorized and tagged DELI, sushi. Bookmark the permalink. Japanese Sweets – Exclusive to JC!